The oil industry spends millions each year to shape its image and shift the public debate in its favor. But amid growing concern over climate change -- and over the industry's clout in Washington -- it can sometimes find itself losing control of its message pretty quickly. That's what happened earlier this month, when the American Petroleum Institute (API), a powerful Washington-based lobbying organization for oil and gas companies, put out a call for volunteers to appear in an upcoming commercial about domestic energy production -- and got more than it bargained for. The ad campaign, scheduled to launch January 1 on CNN and coordinated by the high-priced Edelman PR firm, uses ordinary-looking people, dubbed "Energy Citizens," to insert a pro-oil and gas message into the 2012 elections. But one respondent to the casting call, Connor Gibson, turned out not to be quite what the industry was looking for. Unbeknownst to the organizers, Gibson was an activist with the environmental group Greenpeace, and was surreptitiously recording the proceedings -- recordings that Greenpeace provided exclusively to Yahoo News. As the director begins to feed him his lines, Gibson veers radically off script. With the cameras rolling, he assails what he calls the "lies and influence-peddling" of the oil industry. And before being hurriedly shown the door, Gibson derides the Energy Citizens campaign as "an astroturf front group created by the American Petroleum Institute to make it sound like there is citizen support for petroleum in our energy future." Listen to Gibson's off-message performance, and the organizers' annoyed response. Before intentionally blowing his cover, Gibson also recorded the organizers themselves saying things they might have preferred to keep private. For instance, at one point, a production staffer says participants will be put in costume, then fed lines by a director. That contrasts with API's original call for volunteers, obtained by Greenpeace, which promises participants they'll be able to "express their views" and "have an honest debate." More important, Greenpeace argues, the scripted nature of the ads undercuts the core message they're intended to convey: that there's widespread, authentic, grassroots support for the oil and gas industry. Listen to a production staffer acknowledging that "a director feeds them the lines". And, in an ironic twist, a communications adviser for API reveals the extent to which the industry worries about being attacked by critics. Explaining that the ad's script calls for participants to say that they vote, she asks whether the volunteer is a registered voter. "We at least want to be genuine in the sense that you are a registered voter," she says. "As you can imagine, there are some opponents of the oil and natural gas industry and so we always have to be very careful of, you know, what our opponents could use against us." Listen to an API adviser worrying about "what our opponents could use against us." API didn't respond to a request for comment from Yahoo News. But in a pre-emptive damage-control effort, Mark Green, a communications specialist with the group, made light of the incident, writing in a blog post that the other participants in the shoot genuinely support the industry's position and "want America to use more domestic resources like oil and natural gas." This isn't the first time that API has been accused of faking popular support for traditional energy solutions. 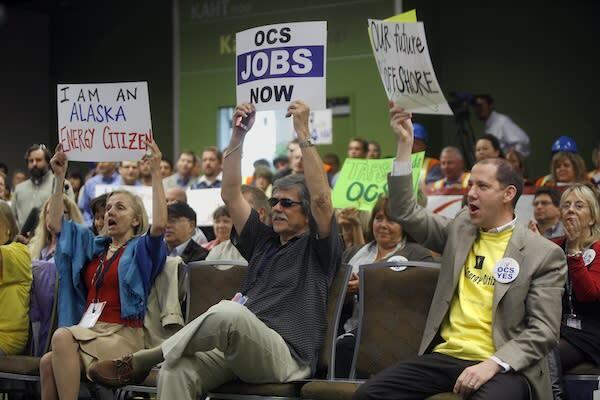 In 2009, its president, Jack Gerard, sent a memo urging member companies to use their own employees for rallies aimed at demonstrating grassroots opposition to climate change legislation. "Please treat this information as sensitive," wrote Gerard. "We don't want critics to know our game plan."